DHAKA, Feb 9 2018 (IPS) - Although Bangladesh has made remarkable recent strides like building green factories and meeting stringent safety standards, garment workers here are still paid one of the lowest minimum wages in the world. While the fashion industry thrives in the West, the workers who form the backbone of the 28-billion-dollar annual garment industry in Bangladesh struggle to survive on wages barely above the poverty line. According to Oxfam, a top fashion industry CEO earned in four days the lifetime pay of a factory worker. Meanwhile, annual export earnings in Bangladesh from the industry grew from about 9.3 billion dollars in 2007 to 28.6 billion in 2016. Encouraged by the growth, Bangladesh has set a target of exporting 50 billion dollars’ worth of apparel annually by 2021, yet the vision mentions no plans to improve workers’ living conditions. Out of Bangladesh’s 166 million people, 31 percent live below the national poverty line of two dollars per day. The current minimum wage for a factory worker is 5,300 Taka (about 64 dollars), up from 3,000 Taka in 2013. As the world’s second largest ready-made garments producer, Bangladesh attracts top labels and companies like Pierre Cardin, Hugo Boss, Wal-Mart, GAP and Levi Strauss, mostly from North America, Europe and very recently Australia, seeking cheap labour. After the tragic Rana Plaza building collapse in 2013, which took 1,134 lives, top buyers gradually increased investment in infrastructure to as much as 400 million dollars in the 2015-16 fiscal year alone to ensure safer working conditions. However, local industry owners have failed to make corresponding improvements to their workers’ quality of life, 85 percent of whom are women. Research by the international aid group Oxfam shows that only two percent of the price of an item of clothing sold in Australia, for example, goes to pay the factory workers who made it. The picture is even worse when it comes to living, food, transport, healthcare and education for the 4.5 million workers employed in about 4,600 vibrant factories. The Oxfam report revealed grim poverty conditions and calculated that a top fashion industry CEO earned in four days the lifetime pay of a factory worker. There are a number of issues at play, including lack of unity among the 16 trade unions, political pressure by the industry owners, loopholes in the national labour laws and misunderstanding about practical living wages and theoretical minimum wages. Nazma Aktar, President of the Sommilito Garment Sramik Federation fighting for women’s rights in the garment industry for over three decades, told IPS, “Most buyers have a business perspective on the ready-made garments industry here in Bangladesh. Their interests are widely on exploiting cheap labour. 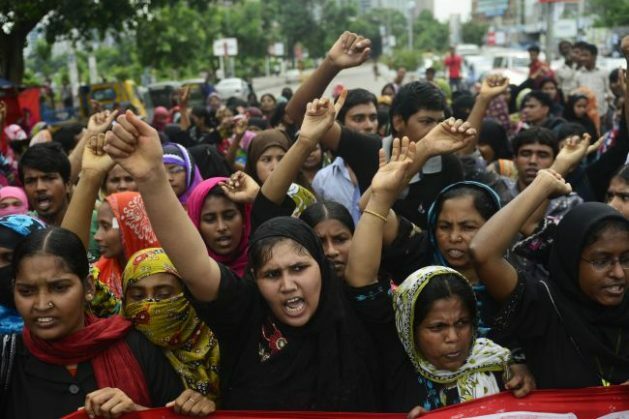 The garment workers’ organisations are demanding Taka 16,000 (about 192 dollars) as the minimum monthly wage, citing rising costs of living. In January, the government formed a panel to initiate what it says will be a permanent wage board and promised to issue recommendations in six months. The unions also plan to seek pay grades depending on the category of worker. Ahmed, who carried out a detailed study on improving wages and working conditions in the Bangladeshi garment sector, explained that while a higher wage for workers is desirable, they would lead to gradual loss of the RMG market in the days of global competition. A sudden increase in wages would also trigger other industries to seek wage hikes. “I suggest a separate pay scale for the RMG sector workers which would have a separate wage board to suggest the increases. But most effective would be to have a regular system of yearly wage increases according to rate of inflation. At the same time, we should also look at increasing production of the factory units by enhancing the skills of the workers who will be paid higher wages. Rahman explains that they proposed Tk 16,000 as minimum wage to the newly formed wage board based on a number of surveys which suggest that a worker requires a minimum of Tk 19,000 for food, shelter, transport, healthcare and other basic needs. “I believe this is very practical and fair proposal as it is merited with evidence on a minimum living standard,” says Rahman. Dr Zahid Hussain, a lead economist in the South Asia Finance and Poverty group of the World Bank, told IPS, “Most people naturally focus on wages as a cost of production for business. The significance of wages as a cost is one component of what economists call ‘real unit labour cost”’. This is the cost of employing a person in terms of the value of the goods and services a business would produce. It depends on two things. The first is the real wage – the purchasing power of the worker’s pay packet, which brings into play prices of goods and services. “The second is the productivity of the worker – how much the worker produces over a given time,” he explained. “The real cost of employing a person over time depends on how these two things change. If productivity is growing, then the real wage can grow without an increase in the real cost of labor for business. But productivity also depends on investment. Changes in technology that allow for greater productivity are often embodied in the new plant and equipment that firms invest in. Siddiqur Rahman, President of Bangladesh Garment Manufacturers and Exporters Association (BGMEA), told IPS that the industry has been offering minimum wages to factory workers considering inflation and efficiency of the workers. “We do not do any injustice to any of our workers,” Rahman insisted.